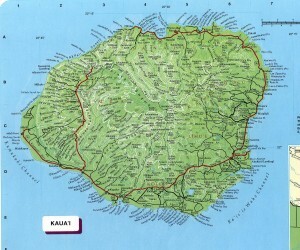 WHY KAUAI: Compared to Maui, I prefer Kauai because it is smaller, less commercially developed and more scenic. It has some of the best hiking along the Na Pali coast, an impressive canyon (Waimea Canyon) spectacular, jungle-clad mountains with waterfalls. 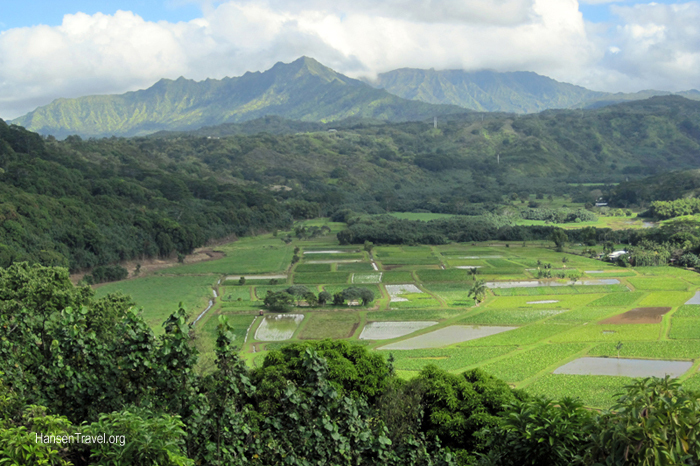 The nature aspect of Kauai is hard to beat. 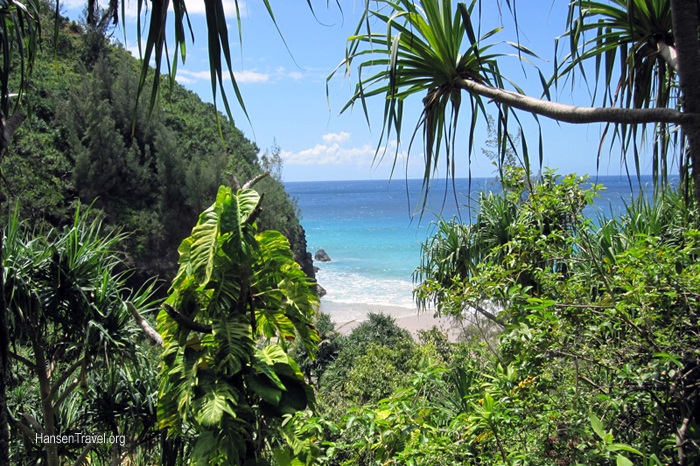 WHAT WE RECOMMEND TO DO: Hiking at the end of the Waimea Canyon road and along the Na Pali coast; snorkeling at Haena Bay. Stay in the Poipu Beach area for convenient access to all sides of the island, but consider Princeville in the north, too. 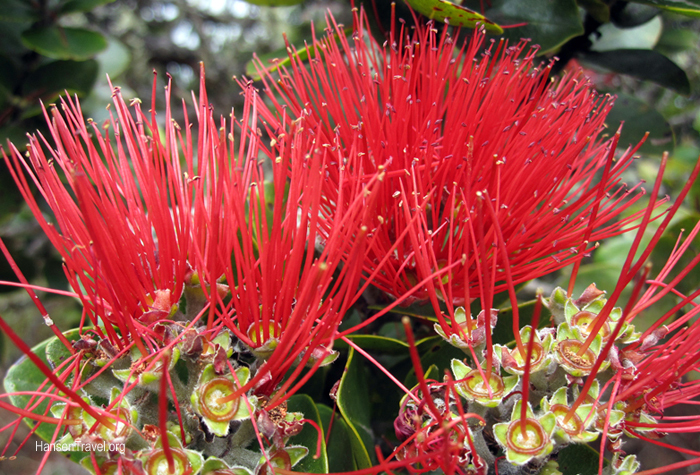 Enjoy the drive from Poipu to Haena Bay with the small bridges, gorgeous vistas. A rental car is necessary for exploring the island; driving was easy, no problem. If you want, you can stock up on supplies at the Costco near the airport or other stores nearby. Keep in mind that only 10% of the island is accessible by road, so bring your hiking “A-game”. WHERE TO STAY: This is a tough one to answer because there are so many good places to stay; this is not a substitute for a full guide book, so do your web research. 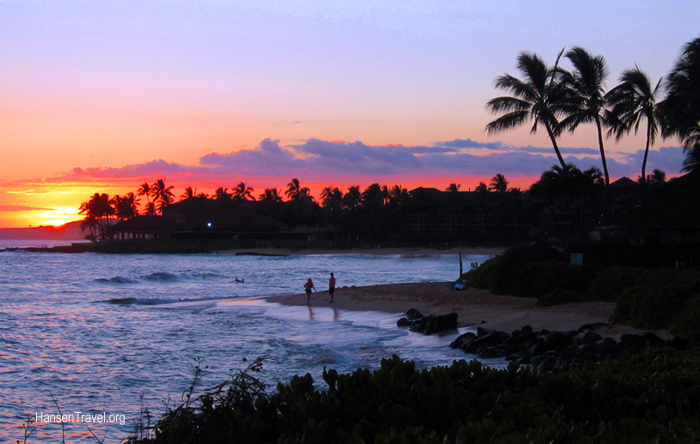 Here’s an idea: call a Kauai realtor or property manager to find short term home/condo rentals at good prices. 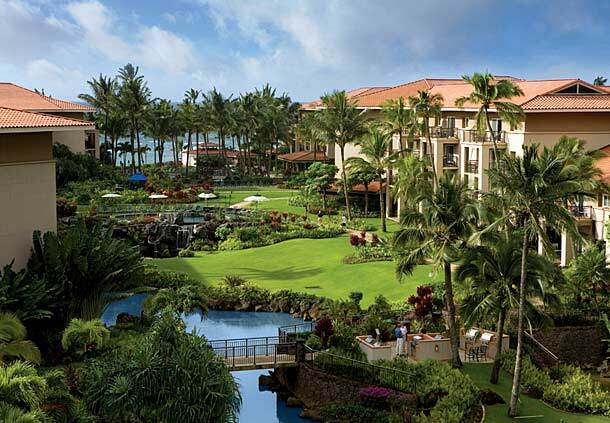 We did a timeshare exchange and stayed at the Marriott Waiohai Beach club in Poipu and were quite happy with it; it’s rather large but well located with attractive landscaping and decent amenities. You can read our notes about it in the following trip journal. OUR TRIP JOURNAL: After our Maui honeymoon, we hoped that Kauai would provide a different version of Hawaii with more natural beauty, snorkeling, hiking and less congestion. It did. We stayed at the Marriott Waiohai Beach Club in Poipu Beach on the south side of the island. The hotel is quite large, with tropical landscaping and ponds, heavily used barbecue areas, a good assortment of restaurants, a large swimming pool and from the beach you get a beautiful view of the sunset off to the west. We would give this hotel a thumbs up: it was conveniently located for most of the things we wanted to do. Something to consider: Our bottom floor room made it easy to go in and out. Lihue is the island’s main airport. Airfares were a challenge to keep under $2000 for two of us, so if price is an issue, consider finding a comprehensive package tour (with air and hotel) or shop airfares carefully in advance. We picked up our rental car and stopped at the Costco for supplies on the way out. Nothing is very far away on this island, with only one main road circling most, but not all of the island. There are two main attractions you don’t want to miss: Waimea Canyon – the Grand Canyon of the Pacific – and the Na Pali Coast. Driving times from Poipu are about one hour to the end of the road for Waimea Canyon, and about one and a half hours to Hanalei Bay in the north. A rental car is a must. Without it, you will only see your hotel and wherever your feet can will take you. 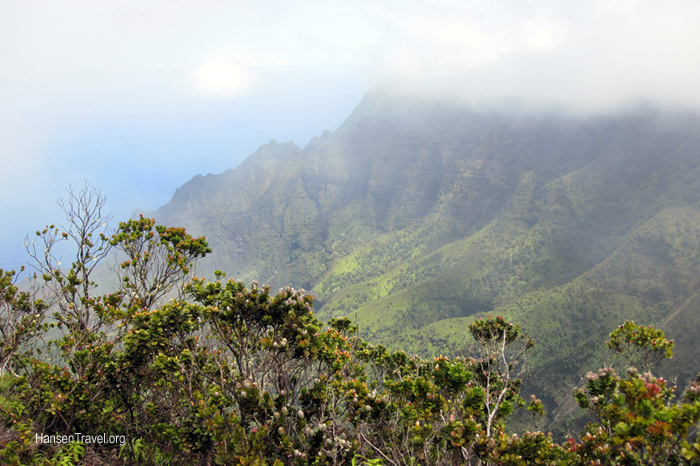 We set out one morning to see the famous Kauai “Grand Canyon” called Waimea Canyon. Get going as early in the morning as you can. We enjoyed the scenery along this eleven mile drive. 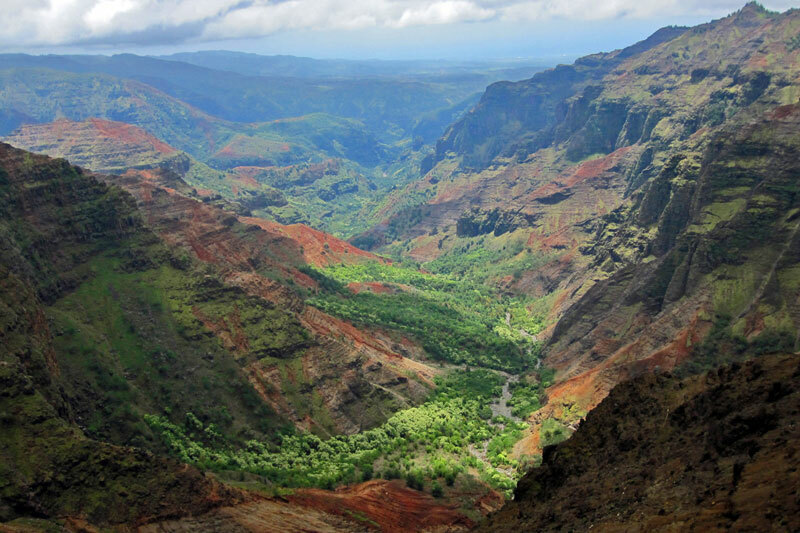 While not as spectacular as the Grand Canyon, Waimea Canyon is beautiful and worth seeing. At the end of Waimea Canyon Drive, you enter Kokee State Park where I recommend parking at the last lot and hiking the trail that goes along the edge of cliffs. We spent over two hours on that trail and could have stayed longer. You’ll get big views of steep, jagged mountains that fall sharply into lush, green valleys and the deep blue ocean in the distance. There were myriad ferns and other tropical plants, intermittent views of postcard-worthy scenes, and finally a long, really fun boardwalk trail built over the marshy terrain, heading gently down the mountain until reaching a great picnic area with grassland, streams and verdant marshes. We were lucky to have such clear views early in our hike because clouds often roll in and take away that special view. Check the weather and try to plan accordingly. Another recommended hike started at our Marriott hotel, headed north from Poipu along the ocean, past some first class hotels, a golf course, craggy lava rock shorelines, ending up at a secluded sandy beach and famous ancient Hawaiian ruins. Round trip the hike took over three hours. 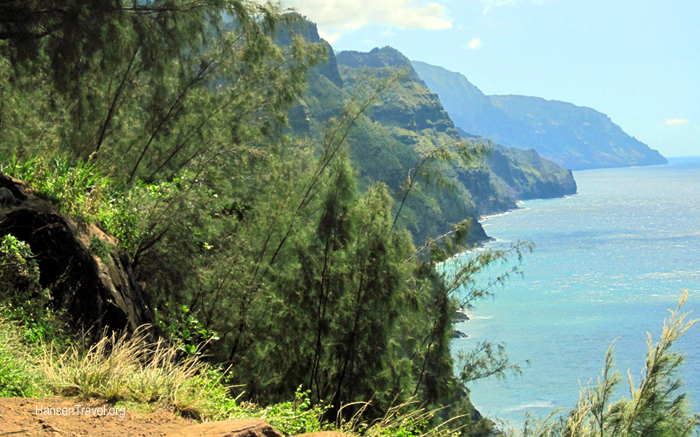 Saving the best for last, you cannot miss doing the drive to Haena and the Na Pali Coast. This drive takes you along the ocean, past a stunning view of an agricultural valley framed by lush green hills and serrated-edged green mountains in the distance. There are occasional one lane bridges as you near the north end of the island–where else do you find this?–and you either proceed or wait for other cars to cross. They are short stretches, so don’t worry. The best is saved for last. When you finally arrive at the end of the road, you are in a magic place. 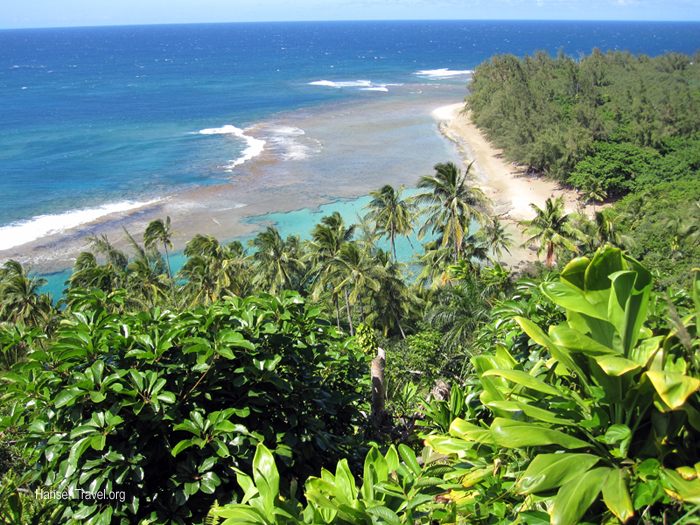 Nearby is Haena Bay, with some of the best snorkeling on the island. The water is clear, warm, not too deep and filled with a good assortment of marine life. The soft sand beaches are inviting for relaxing, sunbathing or having a picnic. 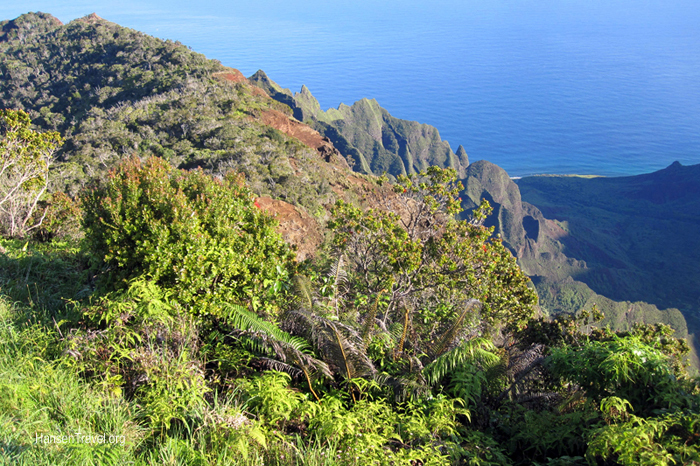 But hiding nearby is the trailhead for one of the more popular hikes anywhere: the Kalalau Trail along the wild, jagged and post-card beautiful Na Pali Coast. This is not an easy trail, though a surprising number of people hike it. My wife and I are good hikers and after nearly seven hours of hiking to the famed waterfalls and back, we were really hot and tired, but totally pleased with the whole adventure. While I recommend this hike to any hiking enthusiast, it should be taken seriously. Forget flip flops. Take a LOT of water. Wear tough shoes–maybe sneakers, but hiking boots are better. To hike the entire 11 miles to the end will take most conditioned hikers a full day and is not on my list of to-do’s; the trail is difficult enough that many people camp along the way. Swimming in the ocean can be a bad idea due to treacherous currents. Learn more about this trail at www.kalalautrail.com. Going the few miles to the waterfall and back is what I recommend to the normal hiker who wants a tough, satisfying, six or seven hour hiking trip (this includes the hour we spent swimming at the waterfall). Total distance is about 8 miles, very little of which is an easy stroll. 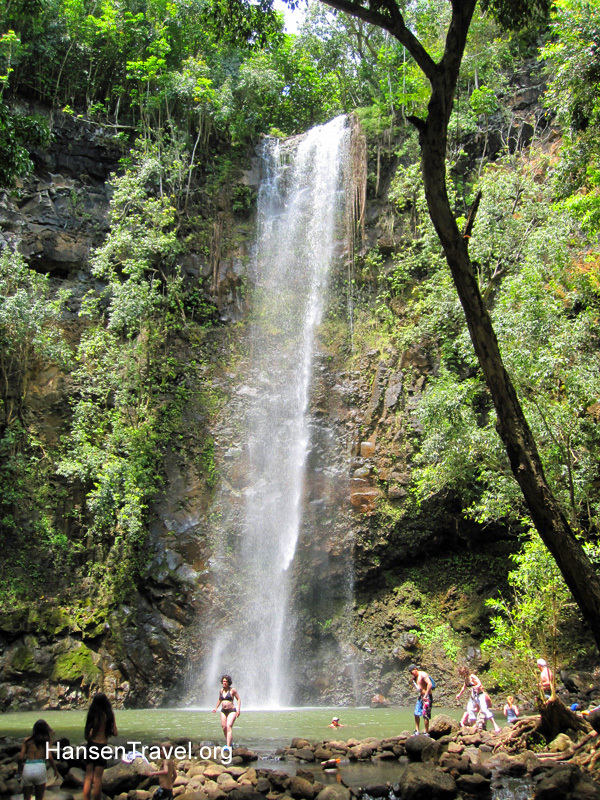 I am compelled to tell you that lots of folks swim in the pool at the base of the tall waterfall, but I didn’t because some medical students warned of contamination by parasites or bacteria that put me off. My wife ignored the remarks and happily swam for a while, with no apparent after effects. So go enjoy Kauai and let me know what you discover! It’s one of the few places I would like to see again.